In the Guest quiescence section, specify which backup method must be used to prepare the VM guest OS for backup. If a VM does not meet requirements for online backup, Veeam Backup & Replication will use the offline backup method. Note that during offline backup a VM is suspended for a short period of time. The selected backup method applies to all VMs in the job. However, if you enable application-aware processing for VMs, the application-aware processing settings will have higher priority than the selected backup method. Offline backup is not applicable to VMs registered on Microsoft Hyper-V Server 2016 and later. If you do not want to suspend VMs in the job, select the Take crash consistent backup instead of suspending VM check box. In this case, Veeam Backup & Replication will create a crash-consistent backup of a VM. In the Changed block tracking section, specify if CBT must be used for VM backup. By default, this option is enabled. CBT dramatically reduces load on the production environment and time required to perform incremental backups. If you have added several VMs to the job, select the Allow processing of multiple VMs with a single volume snapshot check box. 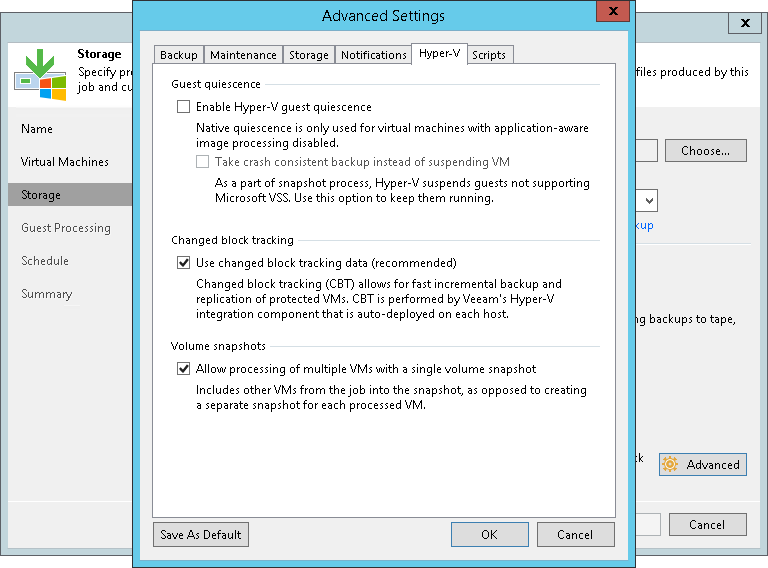 This option helps reduce snapshot workload in the Microsoft Hyper-V environment. When the job starts, Veeam Backup & Replication will group VMs and trigger Microsoft Hyper-V to create one volume snapshot for a group of VMs, instead of creating a volume snapshot per each processed VM. VMs must be located on the same host. Volumes on which VM files reside must use the same VSS provider for snapshot creation. The number of VMs in the group is limited: for a software VSS provider — 4 VMs, for a hardware VSS provider — 8 VMs. Veeam Backup & Replication groups VMs based on the method of snapshot creation that is used for backup: transactionally consistent (VSS) or crash-consistent. For example, you add to the job 2 VMs that are registered on the same host. VM1 resides on volume C:\ and VM2 resides on volume D:\. Both VMs use Microsoft Software Shadow Copy Provider. In this situation, Veeam Backup & Replication will create a single snapshot for these VMs. The Allow processing of multiple VMs with a single volume snapshot option is not applicable to VMs registered on Microsoft Hyper-V Server 2016 and later that are processed in the onhost backup mode.